Update 3:25 p.m. Aircraft have been released and firefighters remain on hand mopping up hotspots at the scene of the fire, which is now contained. 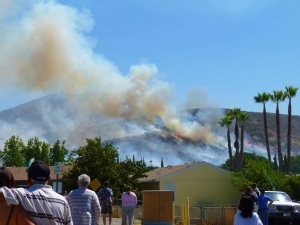 September 18, 2010 (Spring Valley) 2:10 p.m. - The Jamacha Fire is now 50 acres and forward spread is halted, Chief August Ghio of San Miguel Fire confirms. The fire is under joing command of Cal-Fire, U.S. 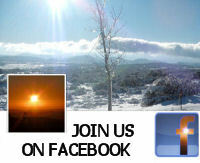 Fish & Wildlife Service, and San Miguel Fire. Anxious residents poured into the streets to watch the fire at the Lamplighter Village mobile home park, where flames encroached just behind the complex. 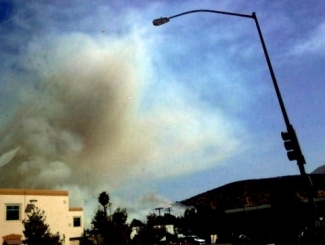 Smoke is visible from throughout East County and an evacuation center has been set up at Skyline Church. "One structure was damaged," said Ghio, who added that evacuations are being stopped and he hopes to let residents back into the area soon. 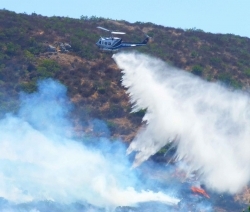 Approximately 80 firefighters are battling the fire, along with three helicopters and two fixed-wing aircraft.